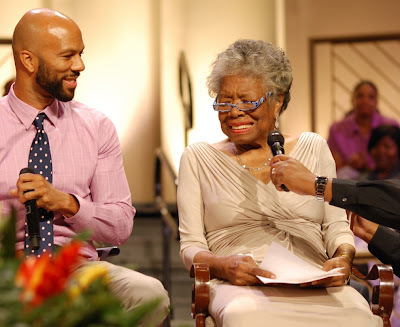 My favorite poet (The reason I started writing poetry and eventually lyrics) Dr. Maya Angelou has been speaking out as to her disappointment with one of my favorite rappers-Common. Sheesh, whats a girl to do, right!? Heres the story... Common met up with the legendary poet/activist at a fundraiser and logically asked her to contribute to his record. An epic idea in my opinion. She laid a beautiful piece over his track and all was well - that is until the song came out. According to the NY Post, Dr. Maya Angelou realized that the song she'd recorded has the N word in it and she is not pleased. Of course one would be stunned by the fact that she didnt think Common uses that word, or that she didnt ask to hear the record before it was released to the public. Common's response seemed to be presented with the same quandary. “She knows I do use the word,” he told The Post. “She knows that’s part of me. The N word is such a touchy subject between the older generation and younger one that I wont further discuss right now, but Im sad that this turned out this way. Hopefully they can find peace with each other after this misunderstanding, they are both amazing contributors to our culture!